The ancient art of metalworking has played an important role in the evolution of mankind -- so much so that entire chapters of human history are known as the Bronze Age and the Iron Age. Today, metal fabrication is an essential process in modern manufacturing, and has evolved into a $340 billion industry in the United States and a nearly $1.5 trillion industry worldwide. The bluetooth-enabled Smart Passivation Tester easily syncs to your smartphone and seamlessly logs your results into a database for easy data analysis and report building. Recently, the evolution of metalworking has taken a giant leap, thanks to the intersection of cutting-edge technology and the "Internet of Things." 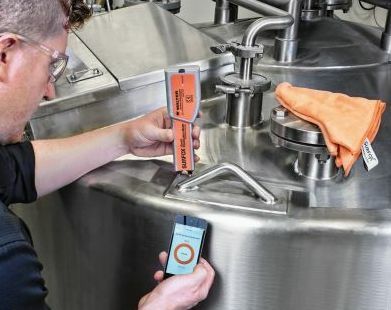 For example, manufacturers of stainless steel equipment now can use a Bluetooth-enabled device to conduct an important quality control procedure known as passivation testing. The testing device enables manufacturers to confidently test, report and guarantee the passivation of their stainless steel pieces -- in-house -- before shipping. The Surfox Smart Passivation Tester, made by Walter Surface Technologies, syncs to smartphones and seamlessly uploads test results to the cloud -- helping machine shops to elevate their time-honored craft and build a competitive advantage in the 21st century global marketplace. "The concept of leveraging technology, cloud-based platforms and mobile apps to support production in the metalworking industry is still emerging," says Jonathan Douville, Product Manager at Walter Surface Technologies, a Windsor, Conn.-based manufacturer of abrasives, power tools and green cleaners for the metalworking industry. "Yet it's a way for machine shops and fabricators to differentiate themselves, offering more efficient and accurate assessments of how their equipment will endure over time." The introduction of the Surfox Smart Passivation Tester is part of a larger trend: Sparked by advances in computing capabilities and wireless technology, the ever-increasing access to the Internet, and the proliferation of mobile devices, manufacturing is entering a digital age. Some have said the convergence of technologies will pave the way for the next industrial revolution -- in which manufacturers use actionable, real-time operational data to drive innovation, reduce waste, improve quality, boost productivity and reap other benefits. Manufacturers can produce their parts with confidence by validating their pieces for passivation with the SURFOX Smart passivation tester. "The next industrial revolution will be data-driven," says Bryce Barnes, senior manager of the machine and robot segment at Cisco Systems. "Those companies that embrace that will prosper, and those companies that don't will be left behind." One of the key ingredients in the recipe for this data-driven industrial revolution is the Internet of Things (IoT). While there's no universal definition, the IoT generally refers to the increasing interconnectivity of people and things via the Internet and personal smart devices. "The Internet of Things will make many of the familiar devices and objects in our lives -- from door locks to toll booths to refrigerators -- suddenly Internet-connected, smartphone-accessible and responsive," explains Marcelo Ballve. "This shift to connectivity in once-inert things -- the logical next step in the growing ubiquity of the Internet -- will force companies large and small to transform dramatically." By embedding sensors and processors in everything from household appliances to industrial machines -- and giving them Internet connectivity -- the IoT promises to make the physical world more intelligent, which has enormous implications for manufacturing and metalworking. "We are seeing the dawn of an era when the most mundane items in our lives can talk wirelessly among themselves, performing tasks on command, giving us data we've never had before," declares Bill Wasik. "Imagine a factory where every machine, every room, feeds back information to solve problems on the production line. Imagine a hotel room where the lights, the stereo and the window shade are not just controlled from a central station but adjust to your preferences before you even walk in. Think of a gym where the machines know your workout as soon as you arrive, or a medical device that can point toward the closest defibrillator when you have a heart attack." 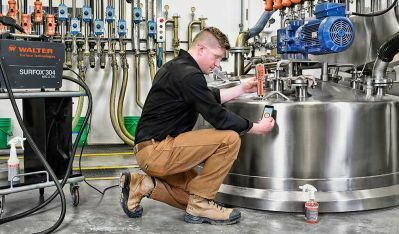 The Surfox Smart Passivation Tester is a prime example of how the Internet of Things and cutting-edge technology are converging to make manufacturers more efficient and competitive. The device puts real-time quality-control data in the hands of machine shops that produce stainless steel equipment for a range of industries, including food and beverage, oil and gas, pharmaceutical and transportation. Manufacturers can test their finished workpiece for passivation with this new wireless passivation tester. The Bluetooth-enabled diagnostic tool quantifies the thickness of the protective oxide layer on stainless steel parts and equipment (the layer forms during a process called passivation), enabling metal fabricators to guarantee that their welded stainless steel products are protected from rust and corrosion when they leave the shop. Stainless steel gets its corrosion-resistant properties from the presence of chromium in the alloy, but it also contains iron, which can react with oxygen to form iron oxide (commonly known as rust). Passivation is the process during which the chromium in stainless steel comes in contact with oxygen, forming a passive chromium oxide layer that protects the surface from corrosion and rust. Because the testing options are costly and time intensive, many metal fabricators simply have to take a "leap of faith" and ship finished pieces to customers under the assumption that the stainless steel has been properly passivated, Douville explains. Shops that produce stainless steel equipment for certain industries might send their pieces to a third party lab for testing. But even in those cases, metal fabricators cannot guarantee the passivation of the pieces that are shipped to the end user, as the testing methods -- such as water-immersion, humidity, salt spray and copper sulfate tests -- are "destructive," according to Douville. "Shops have to send a small sample of stainless steel for testing, and that piece will be certified by the lab to be passivated," Douville explains. "But the lab will never measure the passivation on the real piece that gets shipped to the end user, because those pieces cannot be reused." With the emergence of shop-floor wireless technology, metal fabricators no longer have to rely on third-party tests or leaps of faith. The Surfox Smart Passivation Tester enables machinists to quickly determine if a stainless steel piece has been passivated properly. With the Bluetooth-enabled device, they can use a smartphone or tablet to initiate testing, upload test results and generate reports. "It enables manufacturers of stainless steel equipment to perform quality control on the final pieces that they're shipping to customers -- that's something they weren't able to do in the past," Douville says. "It's a way for them to guarantee the passivation of their products. They can even include the printed report with the shipment or send it to the customer by email." The passivation tester can take a reading in about six seconds, compared to shipping a part out to a lab and waiting a few days for the results. Chad Powell, quality coordinator for PCL Industrial Constructors, part of the PCL group of independent construction companies, says the Surfox Smart Passivation Tester is a welcome addition to the shop floor. "It's very easy to use," Powell says. "We're able to do multiple tests within a very short timeframe." Using the principle of open-circuit potential, the Surfox electro-chemical test probe measures the interface potential of the chromium oxide layer versus the underlying steel, and displays a numeric value for the quality of the passive layer in less than 10 seconds. In addition to preventing costly rework by giving metal fabricators the ability to monitor, measure and guarantee passivation levels on work pieces or finished goods, the device reduces unnecessary downtime associated with sending out work pieces to be cleaned or certified for passivation. The Internet-enabled Surfox device syncs to smartphones and automatically logs test results into an online database for data analysis and report building. Users initiate the passivation-testing process by opening the Surfox app on their smartphones, and can log onto the Surfox website to view test results, establish project-specific testing criteria and print passivation reports. "We're looking to help our customers use these new technologies to become more competitive," Douville says. "The more we can increase awareness of how technology can help deliver an edge to shops, the sooner we can speed adoption of these enhanced processes in the market." 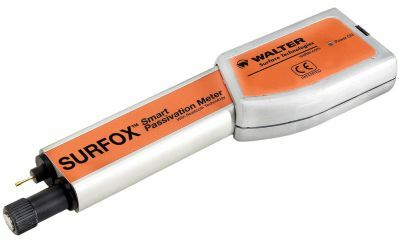 While the Surfox Smart Passivation Tester is designed to take full advantage of the Internet of Things, users don't need to be "connected" to experience the benefits of the device. If Wi-Fi isn't available, or the operator decides not to use the data-storage interface, the "Fast Checking Mode" enables the device to be used offline. Even when used in offline mode, the tester still transmits the passivation values to the user's smartphone via the Surfox app. "The device can take a reading in about six seconds in Fast Checking Mode, compared to shipping a piece out to a lab and waiting a few days for the results," Douville says. "That's going to enable you to shorten your lead time significantly."